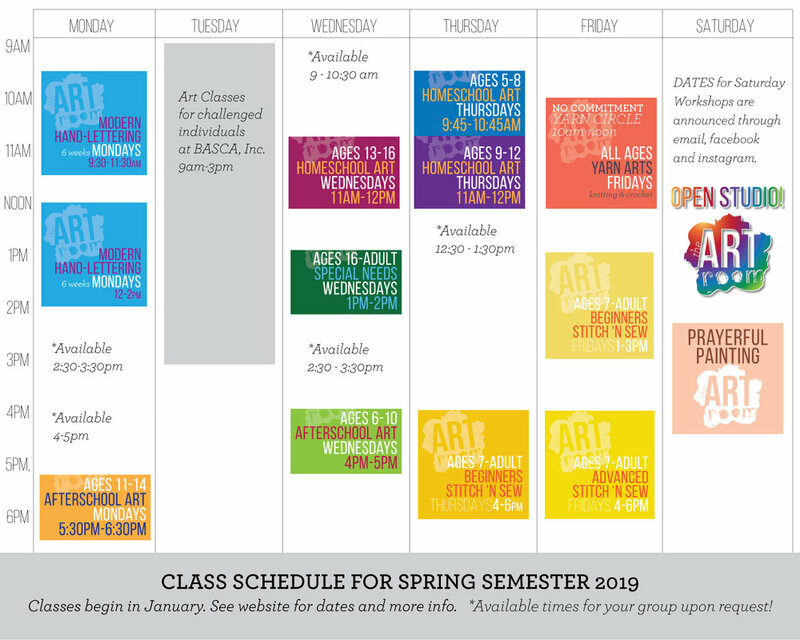 2019 Spring SEMESTER: Classes begin in January, 2019. Please contact me with any questions about ongoing classes or forming a new class. It's never too late to sign up for a class! For the weekly classes we like you to commit to the full length of the semester at the time of joining (see each class for length). Homeschool and Afterschool classes are 16 weeks. You may sign up late but it is meant to be taken for the full semester as projects may last longer than one week and a 16 week curriculum is planned with multiple different lesson and mediums throughout this time. Payments are broken up into 4 week or 16 week total payments for your convenience. Your first payment reserves your space in the class for the semester. Please don’t hesitate to email with questions heather@welcometotheartroom.com.